(1839, Paris, France - 1899). He received his training in Paris, strongly influenced by Corot. In 1862, he studied under Charles Gleyre alongside fellow Impressionists Monet and Renoir. The three students traveled and exhibited together as strong leaders of the movement. 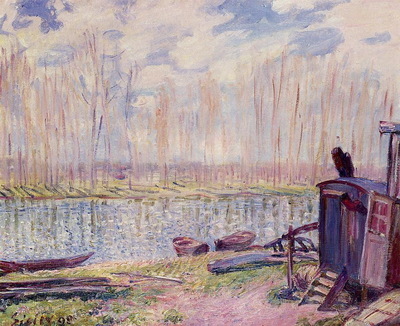 Sisley often painted landscapes of the Sienne, Loire, and the Thames Rivers and focused on light in the clouds and reflections. Because of his lack of salesmanship, Sisley’s work did not sell and was not appreciated until after his death. As a result, he spent the end of his life in poverty.